Discover the religious ‘mysteries’ of the mountaintop monastery of Montserrat during this 5-hour small group tour. Take in the views from this 2,380-foot (725-meter) high complex as you enjoy highlights including the basilica (home to the ‘Black Madonna’), mountain walking tour, and performance by the acclaimed ‘La Escolania de Montserrat’ childrens’ choir. 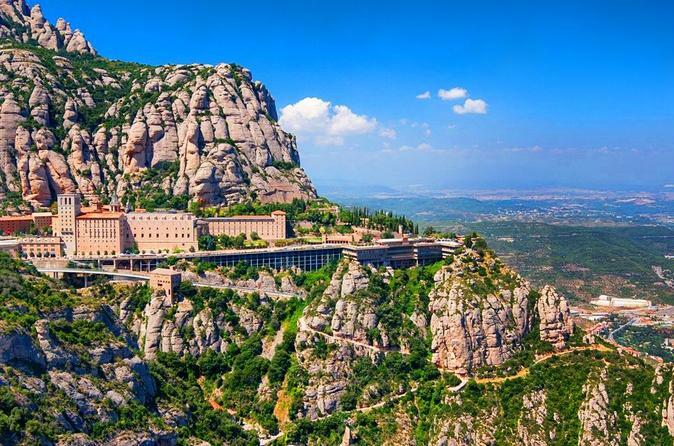 Receive a morning pickup from your Barcelona hotel as you transfer up to the 2,380-foot (725-meter) high “Holy Mountain,” a rocky outcropping high above Catalonia that’s home to the Monserrat religious complex. Explore this spiritual retreat center with your guide and group, stopping by the basilica to see the Virgin of Montserrat, also known as the “Black Madonna.” Learn about the miraculous appearance of the virgin at the site in the 9th century as you admire this romanesque-style carving known for its unique dark skin complexion. Leaving behind the monastery itself, spend some time exploring the surrounding area near the monastery on a walking tour. Soak in the fresh air as you journey to the “Holy Cave,” another site reported to have experienced an appearance by the virgin and another key location for prayer. Finish your trip by enjoying a performance by the ‘La Escolania de Montserrat’ childrens’ choir, one of the oldest in Europe, who will serenade you with their angelic voices. At the end of the trip, you’ll be transferred back to Barcelona, arriving at your hotel by 2:30pm.